Video posted February 19, 2018 in THON 2018 by Centre County Report, Taylor Mason-Little. Video posted February 19, 2018 in THON 2018 by Centre County Report, Danielle Dindak . Photo posted February 18, 2018 in THON 2018 by CommMedia. 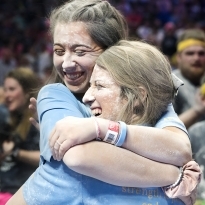 Story/Video posted February 18, 2018 in THON 2018 by Centre County Report. Story posted February 18, 2018 in THON 2018 by Bellisario College of Communications. Photo posted February 17, 2018 in THON 2018 by CommMedia. Video posted February 15, 2018 in THON 2018 by Centre County Report, Katie Filling.